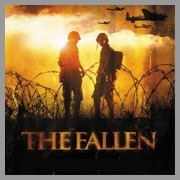 A three-sided story about German, Italian, and American soldiers directed by Ari Taub, The Fallen is set in Northern Italy during the final weeks of the World War II. On the one side, a group of American supply soldiers delivers ammunition to the front line, a journey that becomes a descent into hell as the success of the mission becomes less likely with every setback. On the other side, a doomed German unit and their ragtag Italian partners struggle to maintain morale and discipline amongst their beleaguered troops in the face of certain defeat. Torn between these are the divided loyalties of the Italians, both fascist soldiers and communist partisans, who have turned brother against brother in a bloody civil war. The film looks at the everyday life of the soldiers, their encounters on the road, their hopes and dreams, and the differences in values, morals, and patriotism between the cultures at the end of that era. An official selection of the 2005 Moscow International Film Festival, and winner of the Best Film and Best Director awards at the 2005 Milan International Film Festival.